The Solar and Heliospheric Observatory (SOHO), which is jointly managed by NASA and the European Space Agency, took this photo of the sun on May 11, 2012, after recovering from a technical glitch. The bright speck to the left of the center of the image is the planet Jupiter. A spacecraft designed to stare at the sun is back up and running after a technical glitch temporarily sidelined the observatory for just over a week. 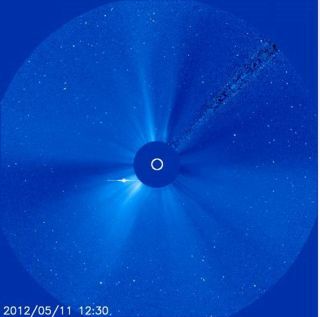 The Solar and Heliospheric Observatory (SOHO), a joint mission by NASA and the European Space Agency, suffered a glitch last week that put the spacecraft in a so-called "safe" mode, said Joe Gurman, a SOHO project scientist at NASA's Goddard Space Flight Center in Greenbelt, Md. "You safe a spacecraft if you don't know what its status is," Gurman told SPACE.com. "This makes sure that you're pointing at the sun, it makes sure the solar arrays are power positive." After engineers at NASA and the European Space Agency worked tirelessly to recover the spacecraft, SOHO successfully sent back a new image of the sun today (May 11), a view that included the bright planet Jupiter. An artist's impression of the SOHO spacecraft. "Happy! @NASA/@ESA's SOHO has been recovered. In this LASCO C3 image we can even see Jupiter," Camilla Corona SDO, the rubber chicken mascot for NASA's Solar Dynamics Observatory, one of the agency's other sun-watching missions, said via Twitter. The gas giant Jupiter is visible as the bright speck left of the center of the new image. While SOHO's ground controllers are unsure of what caused the hiccup, ground operators maintained control of the spacecraft throughout the ordeal, and SOHO never lost sight of the sun, Gurman said. While the observatory is collecting data again, he expects the rest of SOHO's instruments will be functioning as normal by the start of next week. "Not quite everything is up and running, but the spacecraft is back," Gurman said. "The coronagraph is producing data again, and the instruments that are still operating will be on by Monday. We hope by quitting time today that all the various odds and ends that have to be done when you recover a spacecraft have been carried out by the operations team."